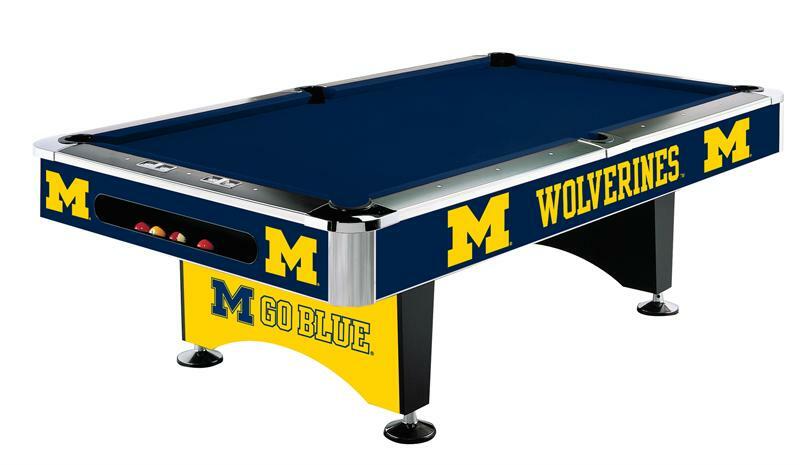 The Michigan Wolverines Pool Table is the ultimate addition to ANY fan cave. This officially licensed team logo pool table is the real deal - 8' Regulation, commercial quality Billiard Table with 1" 3pc Slate. Team graphics are permanently applied to the table using a heat bonding process, and Lexan, a photo quality and scratch resistant material, protects your table while preserving the clear and colorful team colors. The table ships with drop pockets - optional ball return is available for an additional fee. Best of all, it comes complete with inside delivery and installation at no extra charge! Playing dimensions: 44' x 88"